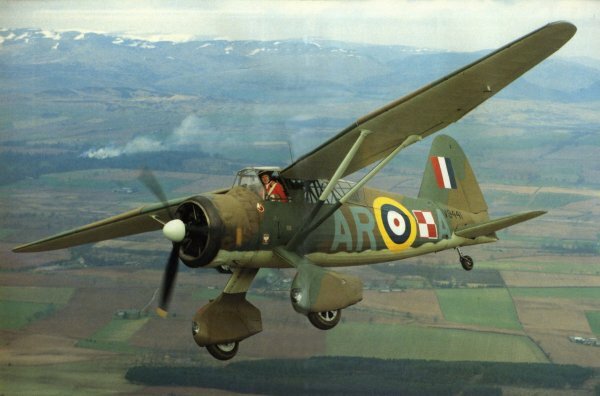 The Westland Lysander (nickname the 'Lizzie') was a British Army co-operation and liaison aircraft, produced by Westland Aircraft, used immediately before and during the Second World War. After becoming obsolete in the army co-operation role, the aircraft's exceptional short-field performance enabled clandestine missions using small, improvised airstrips behind enemy lines to place or recover agents, particularly in occupied France with the help of the French Resistance. British Army air co-operation aircraft were named after mythical or historical military leaders; in this case the Spartan admiral Lysander was chosen. In 1934 the Air Ministry issued Specification A.39/34 for an army co-operation aircraft to replace the Hawker Hector. Initially Hawker Aircraft, Avro and Bristol were invited to submit designs, but after some debate within the Ministry, a submission from Westland was invited as well. The Westland design, internally designated P.8, was the work of Arthur Davenport under the direction of 'Teddy' Petter. It was Petter's second aircraft design and he spent considerable time interviewing Royal Air Force pilots to find out what they wanted from such an aircraft. Less clear was whether he or the pilots understood the army co-operation role and what the army wanted, which was tactical reconnaissance and artillery reconnaissance capability – photographic reconnaissance and observation of artillery fire in daylight – up to about 15,000 yards (14 km) behind the enemy front. The result of Petter's pilot enquiries suggested that field of view, low-speed handling characteristics and STOL performance were the most important requirements. Davenport and Petter designed an aircraft to incorporate these features with unconventional results. 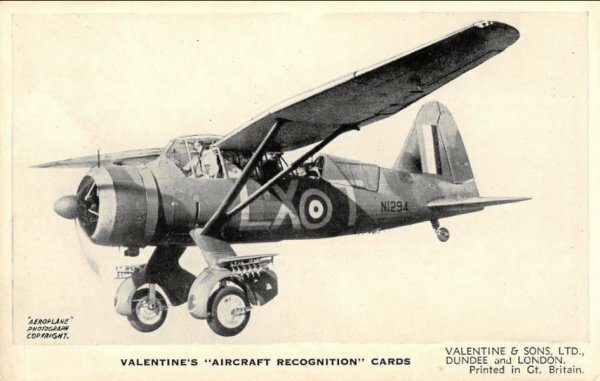 The Lysander was powered by a Bristol Mercury air-cooled radial engine and had high wings and a fixed conventional landing gear mounted on an innovative inverted U square-section tube that supported wing struts at the apex, was in itself resilient, and contained (internal) springs for the faired wheels. The large streamlined spats also each contained a mounting for a browning light machine gun and for small, removable stub wings that could be used to carry light bombs or supply canisters. The wings had a reverse taper towards the root, which gave the impression of a bent gull wing from some angles, although the spars were straight. It had a girder type construction faired with a light wood stringers to give the aerodynamic shape. The forward fuselage was duralumin tube joined with brackets and plates, and the after part was welded stainless steel tubes. Plates and brackets were cut from channel extrusions rather than being formed from sheet steel. The front spar and lift struts were extrusions. The wing itself was fabric covered, and its thickness was maximized at the lift strut anchorage location. Despite its appearance, the Lysander was aerodynamically advanced; being equipped with fully automatic wing slots and slotted flaps and a variable incidence tail-plane. These refinements gave the Lysander a stalling speed of only 65 mph (104 km/h, 56.5 knots). It also featured the largest Elektron alloy extrusion made at the time: the one-piece frame already mentioned that supporting the wings and wheels. The Air Ministry requested two prototypes of the P.8 and the competing Bristol Type 148, quickly selecting the Westland aircraft for production and issuing a contract in September 1936. 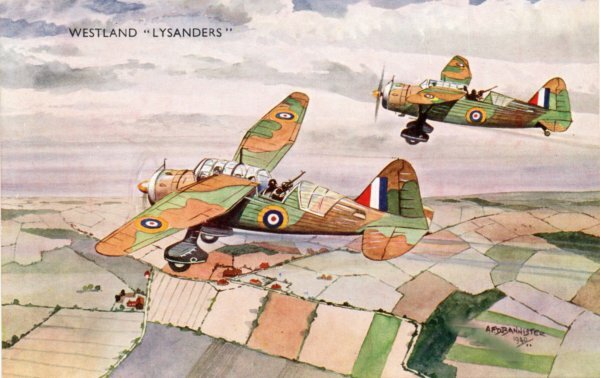 The first Lysanders entered service in June 1938, equipping squadrons for army co-operation and were initially used for message-dropping and artillery spotting. When war broke out in Europe, the earlier Mk Is had been largely replaced by Mk IIs, the older machines heading for the Middle East. Some of these aircraft, now designated type L.1, operated with the Chindits of the British Indian Army in the Burma Campaign of the Second World War. A total of 1,786 Westland Lysanders were produced. Four regular squadrons equipped with Lysanders accompanied the British Expeditionary Force to France in October 1939, and were joined by a further squadron early in 1940. Following the German invasion of France and the low countries on 10 May 1940, Lysanders were put into action as spotters and light bombers. In spite of occasional victories against German aircraft, they made very easy targets for the Luftwaffe even when escorted by Hurricanes. Withdrawn from France during the Dunkirk evacuation, they continued to fly supply-dropping missions to Allied forces from bases in England. 118 Lysanders were lost in or over France and Belgium in May and June 1940, of a total of 175 deployed. With the fall of France, it was clear that the type was unsuitable for the coastal patrol and army co-operation role. Nevertheless, throughout the remainder of 1940, Lysanders flew dawn and dusk patrols off the coast and in the event of an invasion of Britain, they were tasked with attacking the landing beaches with light bombs and machine guns. They were replaced in the home-based army co-operation role from 1941. Some UK-based Lysanders went to work operating air-sea rescue, dropping dinghies to downed RAF aircrew in the English Channel. Fourteen squadrons and flights were formed for this role in 1940 and 1941. In August 1941 a new squadron, 138 (Special Duties) Squadron, was formed to undertake missions for the Special Operations Executive to maintain clandestine contact with the French Resistance. Among its aircraft were Lysander Mk IIIs, which flew over and landed in occupied France. While general supply drops could be left to the rest of No. 138's aircraft, the Lysander could insert and remove agents from the continent or retrieve Allied aircrew who had been shot down over occupied territory and had evaded capture. For this role the Mk IIIs were fitted with a fixed ladder over the port side to hasten access to the rear cockpit and a large drop tank under the belly. In order to slip in unobtrusively Lysanders were painted matte black (some early examples had brown/green camouflaged upper surfaces and later examples had grey/green upper surfaces);[). Operations almost always took place within a week of a full moon, as moonlight was essential for navigation. The aircraft undertook such duties until the liberation of France in 1944. A postcard of the Westland Lysander. A postcard of 1940 featuring a pair of Westland Lysanders. A Westland Lysander fitted with a quick-access ladder. A 1986 centre-spread photograph from Aeroplane Monthly showing the Westland Lysander. The photograph was taken to mark the 50th anniversary of the prototype Lysander's first flight, made on 15 June 1936.